It’s not all prickles and barbs here, there are a few fluffy gobs of pink which have found their way into the garden and onto the kitchen table. Peony season is here and in my opinion the best place for them is a vase. Nearly all the huge blooms end up being cut and brought into the house, they’re so heavy that even with strong stems the flowers end up down in the dirt. Staking would be an option but cutting is far less work, and often they last longer in the house protected from the weather. There’s no simple grace in a double peony, it’s all fat opulence and fluff. This anonymous peony was purchased as a single pink and it’s not even close, but I love it anyway. A wild guess would say it’s ‘Sarah Bernhardt’ but the blooms barely have a fragrance and from what I read Sarah should have scent to spare. No complaints though, fragrant blooms are not welcome in a house full of allergy cursed and fragrance sensitive noses. This entry was posted in cut flowers, early summer, fragrant plants, perennials and tagged cut flowers, flowers, garden, peony. Peonies are with us for such a short time, we have to enjoy them while we can. Yours is so beautiful, so many lovely ruffled petals, very wise to enjoy them indoors! I agree! One of the biggest disappointments is a fierce storm coming along and ruining a flower you’ve been waiting on for months. Much better to have it close to enjoy at all hours. That is a lovely fluffy one. Peonies are one of the few scented flowers I like to bring indoors. Love that smell! Mine always seem to be covered in ants though, so I don’t dare stick my nose too close! LOL! The ants love them here as well! I’m a big fan of the fragrance too, but others here don’t share that opinion. I have to make sure to sneak out and smell the fragrant ones while I can, but just can’t keep them anywhere in the house. I’ve been losing most of my comments on your blog! Something with my account just doesn’t want to go through so I just keep on trying (often unsuccessfully) again and again. Hopefully the bug works itself out since usually I’m not one to have any luck in fixing these things on my own…. Ah, another fragrance-sensitive household (that’s me, in spades – I am the proverbial canary in the coal mine when it comes to scents and smells) …. oh, how I can relate. There are very few flowers that I can bring into the house, so your “scentless Sarah” would be a good choice: very pretty as well as almost hypoallergenic! haha- I never thought of it as a hypo-allergenic flower! It must be though. The vase has been indoors for two days now and not a single complaint has been lodged. You may be onto something! Sorry to hear you are also among the allergy/fragrance sufferers…. 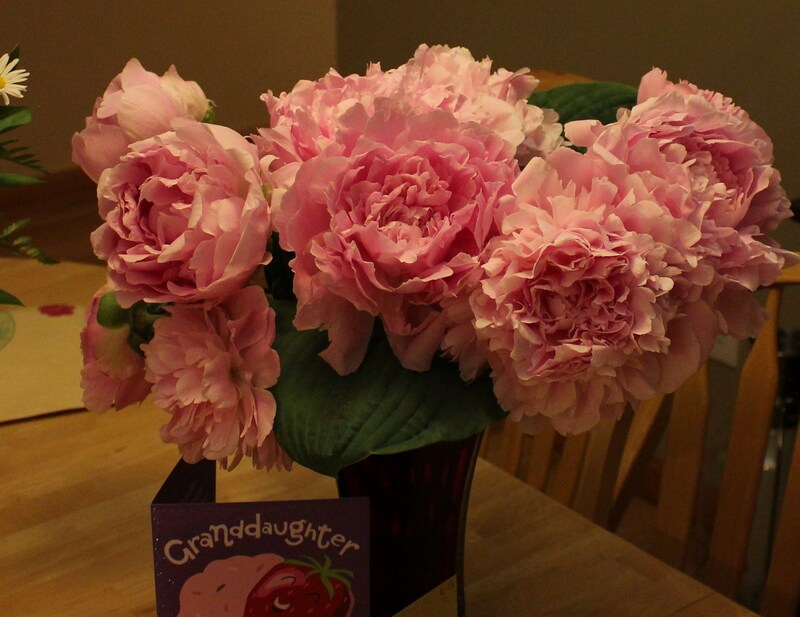 Pink peonies are hard to beat, and you have given them just what they need…a nice way station on the dining table. That’ s better; lovely blowsy pink peonies. Gorgeous. What a relief after those sinister looking spiny things. There are more spines to come but I’ll try to hide them amongst plenty of fluffy pink and soft mauves! That makes sense about cutting the peonies. I think there are a couple of varieties that never really bloomed because of ill-timed rain storms. Someone told me you can cut your peonies in bud and store them in the fridge for weeks. I might have to look into that for next year since everything not-cut ended up facedown in the mud. 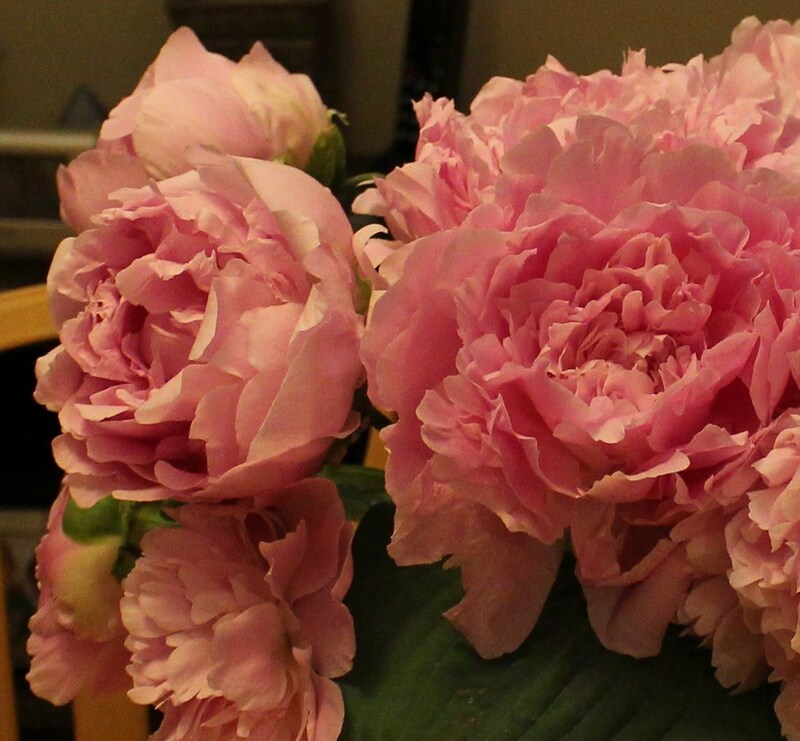 I came home from Toronto and all my single peonies were flattened. Cutting them is a great idea before a storm. Rain flattened peonies are always a disappointment. I hear there are a few weather resistant ones out there but finding them is always a project and the good ones are not cheap! The singles are usually a better choice for harsher weather, but mine get flattened anyway. I say, enjoy the peonies anyway they make you happy, Frank, bloom time is too short anyway. Thanks! 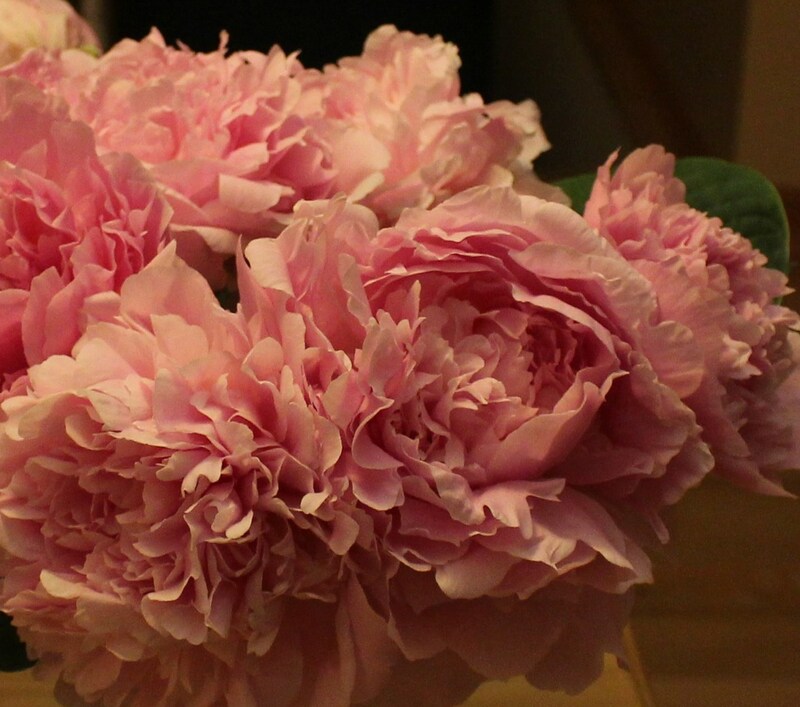 They’re so soft and fragrant and I don’t think a pillow of peony would be the worst idea! Aren’t they gorgeous. Peonies are also at their best here just now and I love these no-name old double varieties. You are right they are best in a vase. We just had a huge downpour during the night so they do look bedraggled this morning but if you cut the main blooms the side shoots bloom well. I also read that you can put the buds in the fridge. I might try it this year. I also like the old ones best, but the idea of a newer one which doesn’t need staking sounds like a tempting trade- off. If you try the fridge trick for peony blooms let me know how it goes!